Good flight. 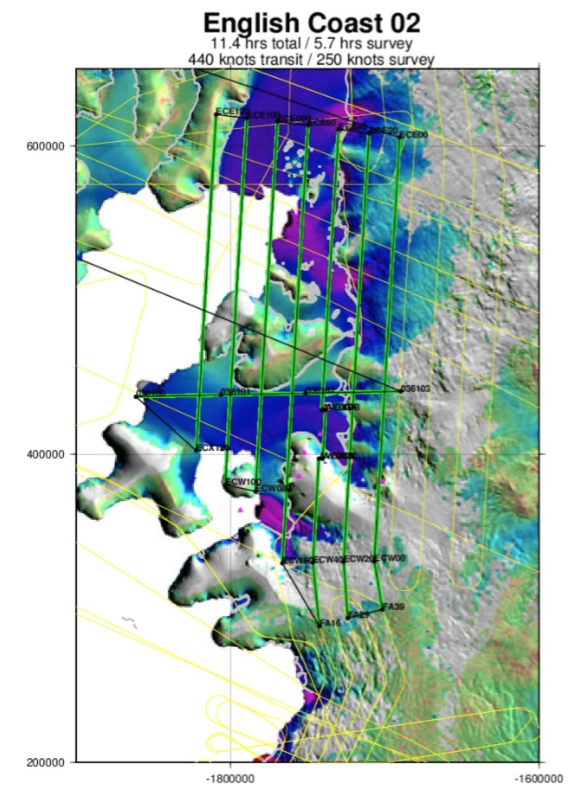 This was a new flight primarily designed to map the bathymetry beneath the Stange Ice Shelf, and the western extremity of the George VI Ice Shelf, along a 20 km coast-parallel grid. There were clouds obscuring some of the lines for some of the instruments. All instruments performed well. The aircraft did well. #1 60hz converter providing instrument power failed during the RTB. Instrument power was transferred to converter #2. 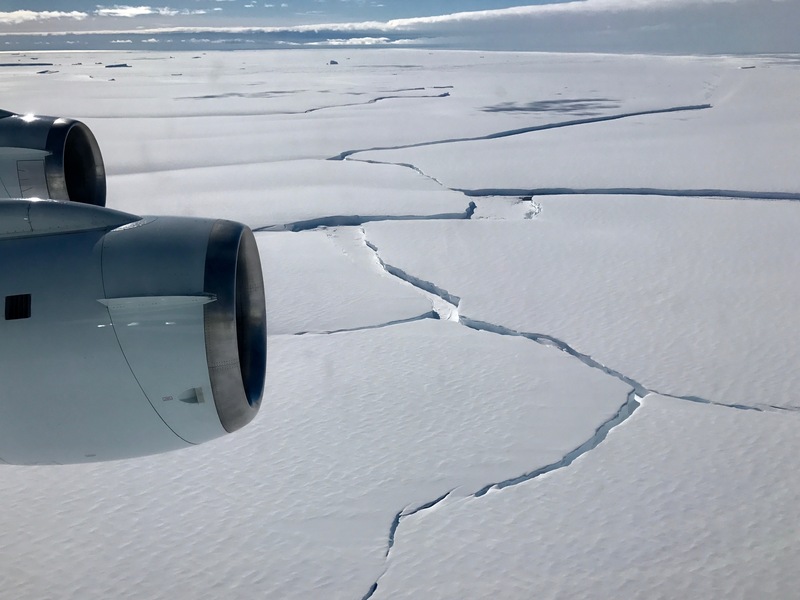 This is a new flight, primarily designed to map the bathymetry beneath the Stange Ice Shelf, and the western extremity of the George VI Ice Shelf, along a 20 km coast-parallel grid. This grid is designed to improve the 20 km grid spacing achieved with the English Coast 01 flight to a 10-km combined grid. This grid connects with the Ferrigno-Alison grid in the west, and overlaps the George VI grid in the east. Observations and forecasts suggested viable missions for English Coast and Hull Land only. Of those two, Hull Land had a slightly better forecast, but was significantly lower priority, so we selected English Coast 02. The predicted stratus layer was observed, but unfortunately it did not dissipate in the manner predicted. Outflow from the ice-sheet plateau within the center of the grid cleared out the layer, but it persisted at both the western and eastern ends of the grid lines. As a result of cloud cover on portions of each line on the grid (typically ~50%, decreasing downstream), useful data was not able to collected by ATM/DMS/FLIR during those portions. We climbed to to avoid the layer when necessary, but were still able to collect radar and gravity data during those periods. All instruments performed well. The DMS position laptop crashed at the beginning of one of the grid lines and had to be rebooted, but it does not appear to have affected data collection. We conducted a ramp pass at 1200' on departure. 1. Map of today's flight. 2. 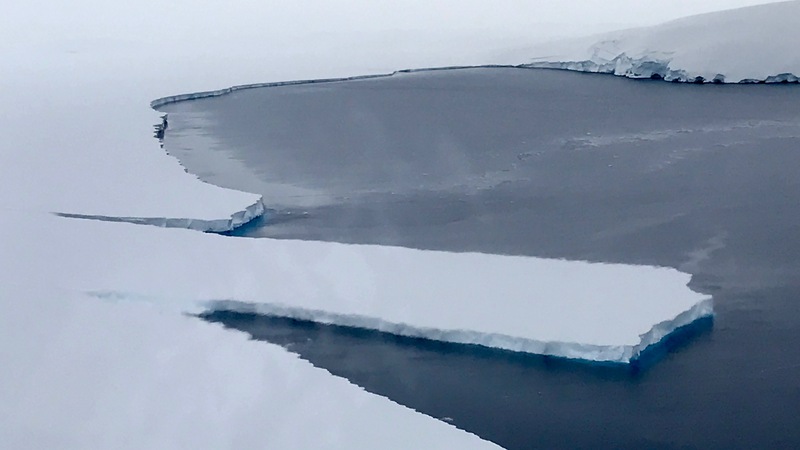 Polynya along the edge of the George VI Ice Shelf (NASA / John Sonntag). 3. 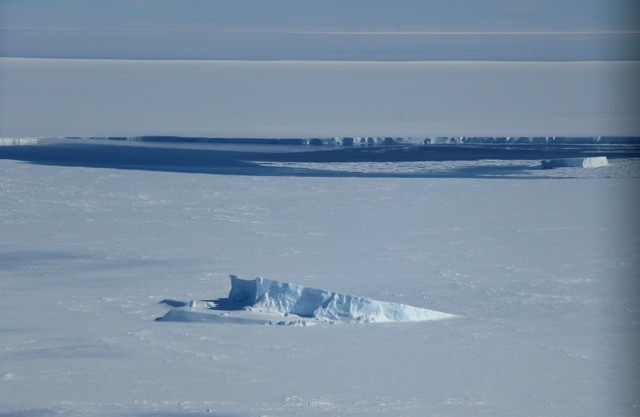 Ice tongue in miniature, George VI Ice Shelf (NASA / Joe MacGregor).